Ukrainian League 2016/17. 32nd round. May 31, 2017. Oleksandriia. CSC Nika. Att: 5,826. 24oC. 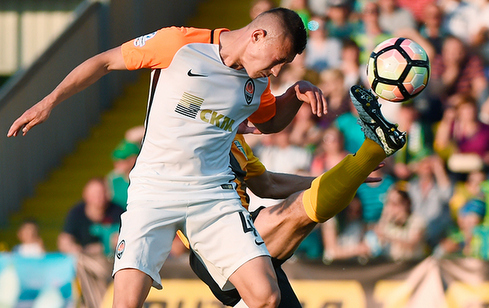 For the clash versus Oleksandriia, Shakhtar coach Paulo Fonseca featured making his debut Oleh Kudryk, as well as Giorgi Arabidze who has not played for the first team this season. Another two Shakhtar U21 players - defender Ihor Kiryukhantsev and midfielder Oleksandr Pikhalionok - were also listed in the ranks. Yaroslav Rakits'kyy brought his teammates onto the pitch wearing the skipper’s armband. The opening stages of the match saw both teams on the front foot. The head-on game continued up to the 19th minute, when the Donetsk team managed to set up a rapid attacking move from the right flank that rounded off with scoring an opener. Giorgi Arabidze broke clear of the defender and curled his left footer along the goal box line, with Boriachuk getting first to the ball. Andrii, who played in the position of out-and-out striker, did not miss the chance. Soon the visiting team pulled level: Oleh Kudryk made a mistake by beating out the ball, before was Serhii Starenkyi picked it up and fired a shot to see it deflecting off Yaroslav Rakits'kyy and then home. Despite the renewed line-up, Shakhtar operated in their usual manner, controlling the ball for a long time, enjoying the territorial advantage and employing flanks regularly. However, the numbers on the scoreboard in the first half have not changed. Immediately after the break, Taras Stepanenko emerged on the field to register his 200th appearance wearing Shakhtar's shirt in the match vs Oleksandriia. The 27-year-old football player, who recently extended the deal with the club for another five years, replaced Giorgi Arabidze. Viacheslav Tankovskyi replaced the Georgian international on the right flank. The home side demonstrated more active performance in the opening minutes of the second half and created two threatening moments near the Donetsk team’s goal. Shakhtar eventually won back the ball possession and took the game into the opponents' half, while slowed down a bit. The 65th minute registered another maiden outing, with Ihor Kiryukhantsev coming on in place of injured Maksym Malyshev in the role of a right defender. Paulo Fonseca’s men continued to launch set-play attacking moves. As for the opponents, they counted on rapid counter-attacks. In the 79th minute, Shakhtar mentor made the final substitution and fielded Oleksandr Pikhalionok who made his debut appearance for the first team. 20-year-old midfielder replaced Vasyl Kobin who operated in the midfield before the final whistle. In the dying minutes of the meeting, a close opportunity came Ivan Ordets’ way, however, Oleksandriia goalkeeper managed to deny his header after playing a corner – 1-1.